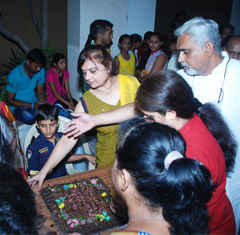 Celebration comes alive and smiles spreads the happiness, the heart feels peace when together we cut the cake, sing a song of birthday with the street children. 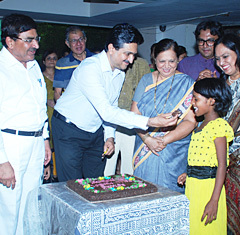 We have celebrated birthday of Rotary Dolls Museum with street children. We have also arranged for Jumpoline and Trampoline to make their childhood alive. 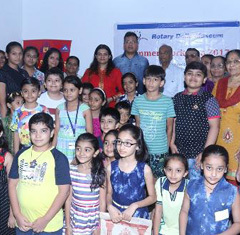 Independence was celebrated with great splendor, joy, pride and respect for Mother India at Rotary Dolls Museum. 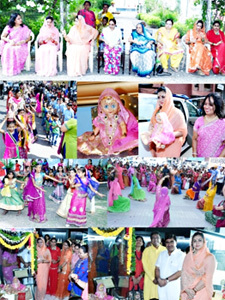 It is a national festival and has equal importance for every Indian regardless of religion, class, creed or race. The way of celebration is also the same throughout the country and that is the day when you will find whole India celebrating and rejoicing. 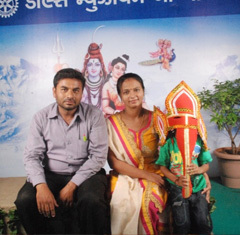 Gnesh Utsav is one of the most popular festivals of India. Ganesha comes to meet all of us as family and we celebrate it as blessings and fortune, together it brings flavor of Prasad, soul sound of aarti and holy atmosphere. 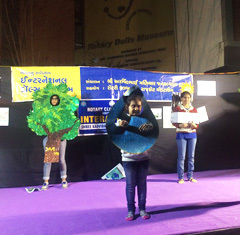 Children expressed joy with their dance, play and different activities at Rotary Dolls Museum Bal Gansesh utsav. 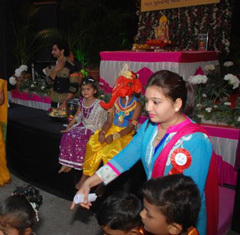 Students from different schools have performed various dance forms like traditional dance, modern dance, sward dance, play and many more on Ganeshji’s songs (Ganesh Vandana). 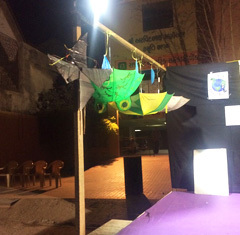 We have also arranged the Puppet show to keep alive the rare art form which is actually being extinct from our life. 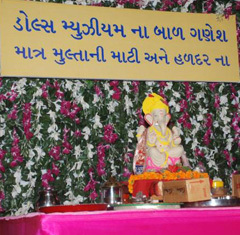 We have also tried to keep alive another art of pottery by arranging a potter who was making Ganeshji live with clay. Christmas is a time to give and forgive. 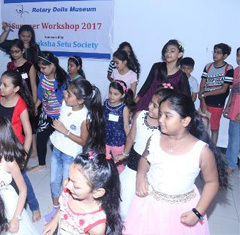 It celebrate everywhere as a joyous family affair, we too, at Rotary Dolls Museum celebrated Christmas as a happy time for children. Santa came to meet us and we cheer it with innocent smiles of children. Gift of happiness that comes to this children is priceless. 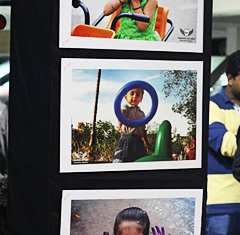 We take thousands of pictures nowadays, but do we still cherish them? 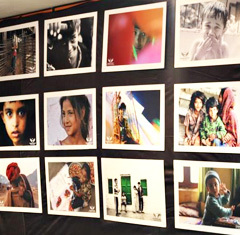 Photographs show us the reality so subtle that it becomes more real than reality. 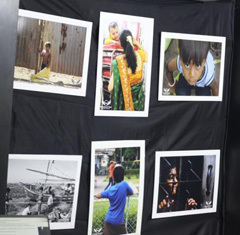 The realities are captured and exhibited for the people to know and feel the truth of surrounding that sometimes missed out in our routine life through Kalrav photography exhibition at Rotary Dolls Museum. 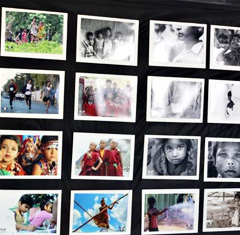 There were photographs of renowned photographers from all over India. Cheering up the participants of marathon, with the message of clinliness and save environment through fancy dress by children, who ran for the betterment and cause that matters to the mankind. Sun was at its high and kids were sketching it on a drawing paper and canvas. 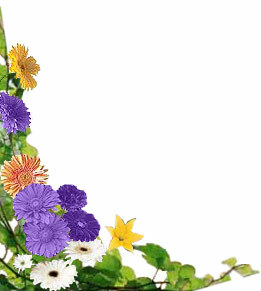 Their imagination were taking shape and reaching the sky without any boundary. 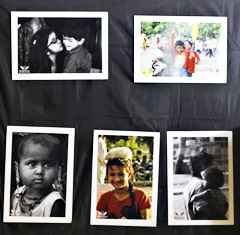 We have arranged different activities for overall development of children. 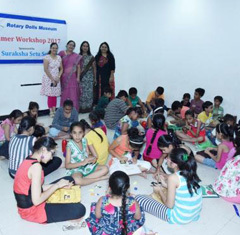 We have arranged Art & craft and Card Making workshop for creativity, Marshal Art for self defense, Drama for personality development, Ganeshji and Diya making on wheels from clay with traditional way (pottery), cooking workshop for children and their mothers. A Royal doll Princess enters in the family of dolls from worldwide. She joins the family with traditional band, sward dance by female members of Bhagini Mandal and little school girls and the royal attire. She was gifted by the one and only Maharani of Rajkot Shri Kadambari Devi.